My fountain pen obsession continues, unabated. The problem is, once you start, you find out what kinds of features you enjoy in a fountain pen, and which don’t work so well for you, and you have to keep on acquiring pens explore that even further. The other problem is that if you develop an ‘ink habit’ too, you want to get more pens so that you can have pens filled with each of your favourite inks. A very kind birthday gift of some money allowed me to indulge my fountain pen problem, I mean hobby, as I could buy a pen and ink bottle duo I’d had my eye on for a while. The TWSBI Diamond Mini is — as the name suggests — a smaller version of the TWSBI Diamond 530/40/80. I already have a TWSBI Diamond 540, which is currently filled with J. Herbin’s wonderful Lierre Sauvage (ivy green), so I knew that the build quality was very good and that I liked the general style and the piston filling mechanism1. 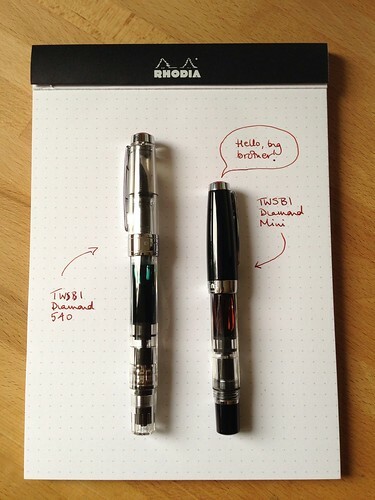 However, as soon as I saw that TWSBI had brought out a mini version of the Diamond, I wanted to get one. I’m a sucker for mini pens, and because of my tiny Hobbit hands, I do find the 540 a little on the long/heavy side. I can’t write with the cap posted, for example, because it unbalances the pen, but even unposted, it is very slightly too large in my hands. I use it for marking (hence the green ink), so that isn’t a huge problem. After too many essays or exam scripts, my hand forms a tight, angry claw anyway, so a large and robust pen is beneficial in those circumstances. I saw the Diamond Mini as a possible alternative note-taking pen that would be small, reliable and that I could keep inked up in another colour to keep my Lamy 2000 company. I really like the Mini. It seems to have shot to second place in my fountain pen league table, second only to the hallowed Lamy. It’s incredibly cute when capped, but the perfect size when you post the cap. Brilliantly, there are threads on the end of the pen so that you can screw the cap on to post it securely. It’s about one full turn for a firm fit, so if you’re marginally obsessive-compulsive like me, you want to start with the clip uppermost (i.e. on the same side as the top of the nib) before you screw it on, and then you end up with the clip on top where it looks neat and doesn’t interfere with your grip. My hands are so Hobbit-sized that I can actually also use it fairly comfortably unposted, but it is better balanced when posted. I chose the model which has a black cap, section and piston knob, but with a clear barrel, so that you can see how much ink you have left. You can also get a fully transparent model or a fully opaque (black only) model, all of which look smart. I also got a medium nib, naturally. The filling mechanism is quick (and incredibly easy with the Ink Bottle — see below), and the nib writes beautifully smoothly. It’s not quite as wet and buttery smooth as the Lamy, but it is a very close second and addictive to write with. In some ways, it would make a better note-taking pen, as it is slightly drier, so there would be no problems with smearing. It starts perfectly each time and feels very natural and comfortable in my hand. I can’t vouch for how well it would work for you if you have larger hands, but I think unless you prefer huge, heavy pens, you would find it comfortable. It would certainly be a very convenient pen to keep clipped in a pocket as it’s so short when capped. I bought the TWSBI pen and ink bottle from The Writing Desk, and as a nice bonus, they had an offer for a free 30 ml sample of one of three Diamine inks with the purchase of a TWSBI pen. I chose ‘Ancient Copper’ as I don’t have a nice brown at the moment. It’s a gorgeous colour: a lovely rich, warm, autumnal browny-red, that has great shading, even with a M nib. It’s a treat to write with, and looks beautiful on the page, so my Diamond Mini is filled with that ink at the moment. 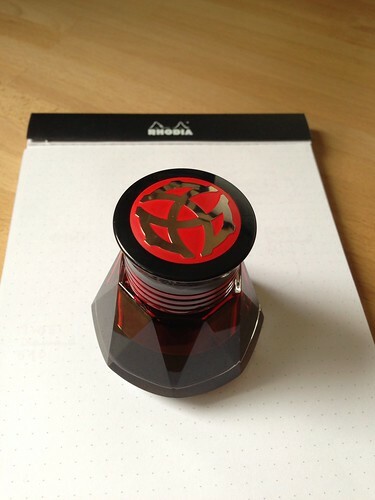 TWSBI have made a special ink bottle for some time, and I had thought about getting one before but it seemed a little pricey. Then I saw that they were making a slightly cheaper version called the 50P that replaced the aluminium cap of the original with a plastic cap. I’m sure the aluminium cap version is lovely, but the 50P is great and the reduction in price makes it more affordable. You may wonder what is the point of buying an ink bottle. Surely inks come in bottles from which you can fill your pen? Well, yes, they do, but the bottle designs can make it difficult to fill your pen when the level runs low. The Diamond Ink Bottle has a couple of clever tricks that make it very easy and clean to fill your pen. If you are using a non-Diamond pen, there is a tapered plastic insert in the bottle that sits inside the neck and touches the bottom of the bottle. There are a couple of slits in the top, so if you cap the bottle and invert it, the ink flows into this insert. This means that even if the level in the bottle is low, you can still easily submerge the nib in the ink inside the insert. It’s a simple thing, but very clever.